As we approach the later years in life many of us may harbour a desire to take it easy, to relax and taper off the pace of life to enjoy the little things…and then there’s some people that just put their foot to the floor. When it comes to new Jaguar customer Marcia Mills that is quite literally the case. 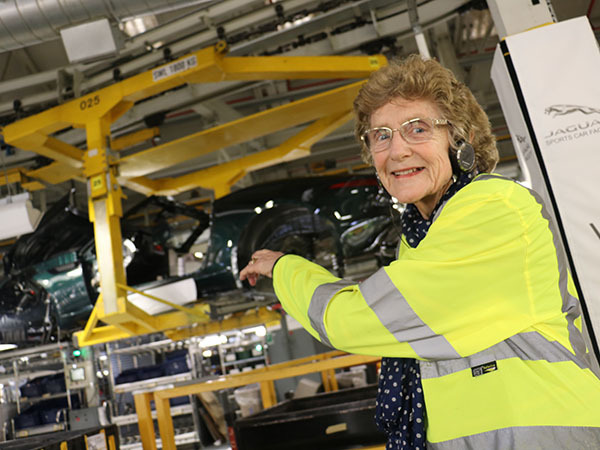 The 78-year-old made the near-12,000-mile trip from New Zealand to Castle Bromwich recently after placing her order for an F-TYPE V6 and believe it or not the order of this particular car, you could argue, has been a decision 60 years in the making. The Auckland native decided to take a trip around Castle Brom whilst visiting family in Oxford. It’s been quite an action packed trip in fact for the grandmother-of-ten which involved a stop off in Sofia in Bulgaria to see one of them represent New Zealand in the World Junior Trampolining Championships where she ended up a finalist (we think a congratulations is in order). 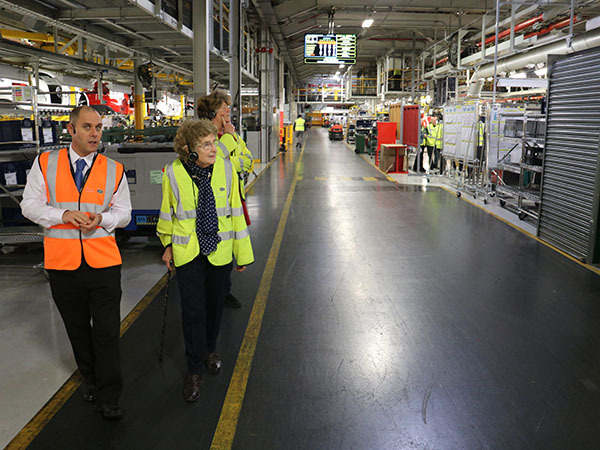 The retired school teacher was joined by her daughter Rebecca as they were given a personal tour around A1/A2 where her new F-TYPE is soon to be built before it is shipped to her doorstep halfway around the world. Jaguar lead host Matt Cook laid on the VIP treatment for the pair who, after their walk around observing the processes in Sports Car Facility, then sat down with People Talk to have a chat about their experience and why Marcia felt that now was the perfect time to stick 380 horses on her driveway. 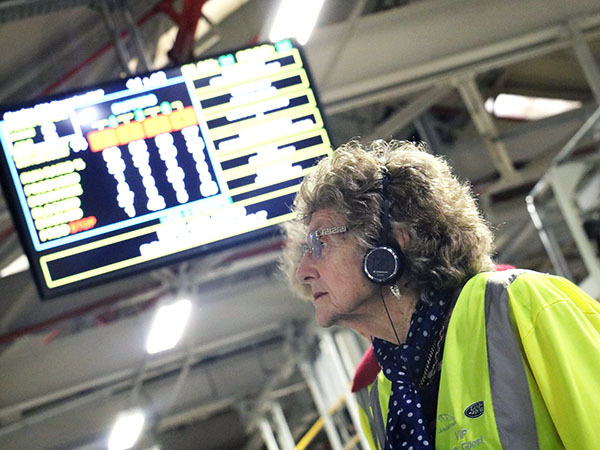 “Well if I’m going to do it I want to do it now,” she said in what we began to suspect would not be an unusual caution-to-the-wind style for the near octogenarian. “I’ve had a passion for cars all my life. I’ve always had four-seaters and with the grandchildren now mostly grown up and no need to ferry people about anymore I felt that now was a perfect opportunity to do something like this and the F-TYPE was the car that I thought about straight away. Marcia said she owed her early passion for cars to her late husband John. When they were merely acquaintances at university in the late 1950’s she said he was the only one who had a car and he broke the ice by offering to take her for a spin in it. That first meeting was the start of what was to become a 50-year marriage before John sadly passed away ten years ago. “He taught me to drive and within six months I had my licence. After that we always enjoyed cars together all the way through our marriage. When it came to the choosing the colour as well, it was another moment of pure chance that influenced the mum-of-four’s decision. 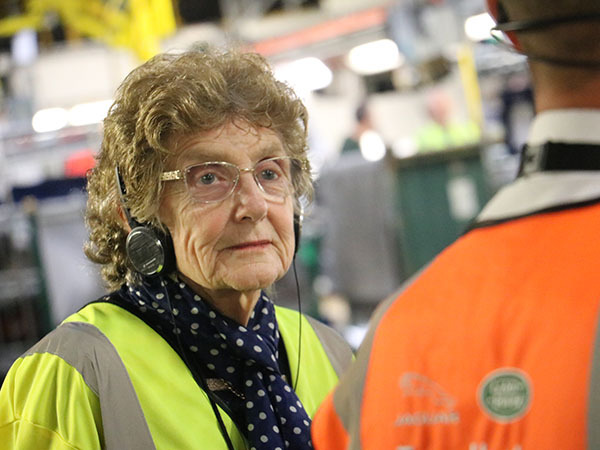 In fact it was just another of a series of occurrences that makes you feel that Marcia’s journey into this particular F-TYPE has a little bit of fate about it. “I went to the supermarket back home in Auckland and there was this Maserati in the car park and I thought it was lovely but then this Jag rolled in and I couldn’t take my eyes off it,” she said. That particular car was a British Racing Green XJ and from that moment Marcia made a decision that if she was to go for a new car then that was the colour it was going to be in. It will probably come as no surprise that Marcia is itching to get the keys to her new purchase which will arrive with her early in the new year. We wanted to know though what her first trip was going to be when she takes it for that first spin. “I think probably to see the grandchildren because they’ve been so excited since they found out that I was getting one,” she added. Well Marcia we salute you. We hope you have the most fantastic time owning your F-TYPE and the team here will be delighted to know that something we build brings you so much joy!